So the teachers of Ireland are having their annual get-togethers as I write this and there seem to be two things that are engaging the nation as a result....well those who are on Twitter anyway. Twitter was also consumed with lecturing the badly behaved teachers who showed no respect for their Minister by their heckling, use of a megaphone and slow clapping. If I saw one I saw ten tweets to the effect that teachers should be providing better example to their students by behaving better. Mmmmm... I have a sneaking regard for rebels and strongly believe in the need to make our voices heard when we passionately disagree with something that is being implemented. I still believe that most teachers have the welfare of our children at heart so I can understand their anger. 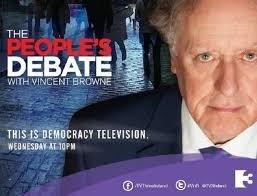 When I watched the first of TV3’s new format People’s Debates with Vincent Browne I admired the courage of the station in attempting to give equal voice to ‘ordinary’ people as to elected politicians and aspiring politicians. However I did feel that there was a lot of shouting and not a lot of coherence. So when the second one was announced as being a women only debate on the subject as to whether or not we had yet achieved ‘liberation’ I wasn’t overly enthusiastic. But being me and afraid I might miss something, a character trait (flaw?) that has kept me on Twitter for six years, I rocked along to the magnificent HD studios in Ballymount last Wednesday. As someone who is a member of the National Women’s Council and also involved with the Women on Air group, I was immediately surprised that I didn’t know more than a handful of the women present. As I took my seat in the studio I wondered if there was some kind of snobbery at work here. There weren’t many (if any) TDs at the first People’s Debate and there was not a sign of a woman TD last Wednesday either. I know we don’t exactly have a lot of female TDs but I was disappointed that not one had shown up. The full debate is now available on the 3Player and you canwatch it here. I enjoyed the evening very much. There is something very .... I am slow to say special...but it is special when a group of women come together. Perhaps it’s the very different energy, the different dynamic. I was struck by the humour of the evening and also by the very articulate contributions from almost every woman who spoke. There was passion too. And believe me there were all points of view in the studio... from very Catholic women to women who were very vocal campaigners for liberal abortion. I am aware from the commentary on Twitter afterwards that some women felt their voices weren’t heard and that is a shame but I guess an inevitable fact at any event. But I felt that there was a tangible willingness in the studio for women to listen to each other. It was said time and time again that true equality is about choice. And this is something I have written about many times. But more than choice I also think that in order for the cause of feminism to move forward we women must be tolerant of views that run completely to our own. Abortion is possibly the most divisive of these issues but there are others too. It is vital that as women we realise that to move forward we must all stand together. We must park our differences and our battles over issues such as abortion. I understand that abortion is something many feminists will say is fundamental to our freedom as women... but if we continue to insist on all women signing up to that agenda we are doomed to failure. There are also very feminist women who do not support liberal abortion laws. That does not make them less of a feminist. Equality is indeed about choice but it is also about tolerance. We are not a homogenous group – we are as different as we are the same. As the debate wound to its conclusion two things were clear to me. The new Irish women – many of whom on the night were African had so much to add to our conversation about equality. Their voices were such a welcome addition and they brought wonderful insights to the debate. The other thing that came up time and time again was the ‘work of caring’. Until we as a nation value the work of caring and until it is subsidised by our taxes we will never be fully liberated. Exactly 100 years before we gathered in a TV studio in Ballymount, a group of women met in Wynne’s Hotel in Dublin and founded Cumann na mBan. I have no doubt that these women were equally full of passion and enthusiasm for their cause and the cause of national freedom. But in the end they were divided, like the rest of the country on the issue of partition and the Treaty. And so the cause of Irish women’s liberation ground to a halt. There is a lesson there for women of 2014. Some issues will remain divisive for years to come. Don’t let that force us apart and therefore delay our full liberation for another century.